This is comfort food at its best. 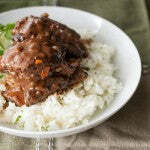 Don’t let the long cook time or the extensive list of ingredients put you off – dish comes together fairly quickly, and spends the rest of the afternoon simmering away on the stovetop, yielding meltingly soft beef and a complex sauce that layers roasty coffee and cocoa with smoky chipotle and rich Dark Chocolate Dreams peanut butter. All you need is a bed of fluffy rice or soft polenta to soak up the sauce, and you’ve got yourself a meal fit for company (or just for a cold winter’s evening). 1. 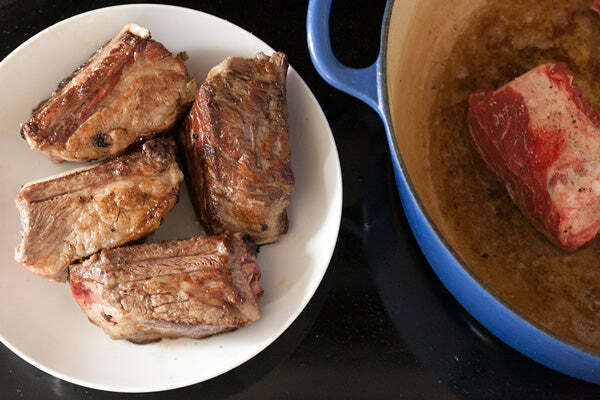 Pat the short ribs dry, and season all over with salt and pepper. 2. In a large, heavy-bottomed Dutch oven set over medium-high heat, heat the olive oil. 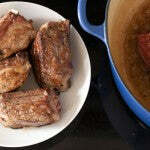 Add the short ribs and sear until well browned on all sides, then transfer to a platter. 3. 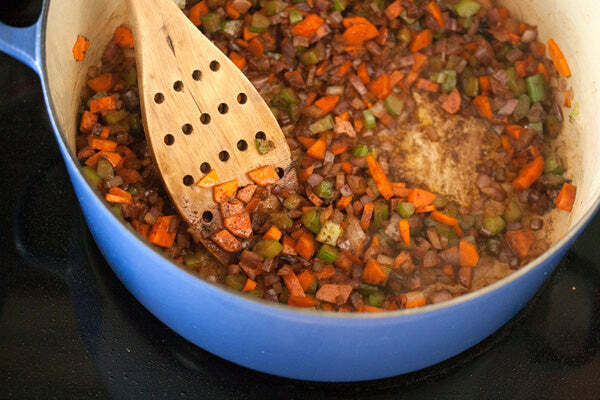 Add the carrots, celery and onions to the Dutch oven and saute for about 5 minutes or until the onions are soft and translucent. 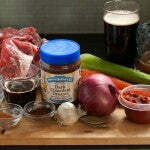 Add the garlic, cocoa, and chili powder, and cook for one minute more. 4. Stir in the beer and deglaze the pan, making sure to scrape up any browned bits that are stuck to the bottom of the pan. Stir in the beef stock, espresso, tomato paste, chipotles, bay leaves, cinnamon, and allspice. 5. 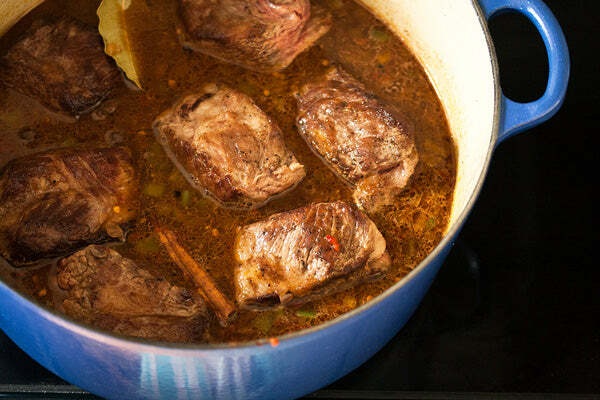 Return the seared short ribs to the Dutch oven. 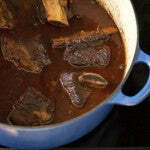 Bring the mixture to a simmer, then reduce heat to low and cook for 2-3 hours, or until the ribs are very tender and falling off the bone. 6. 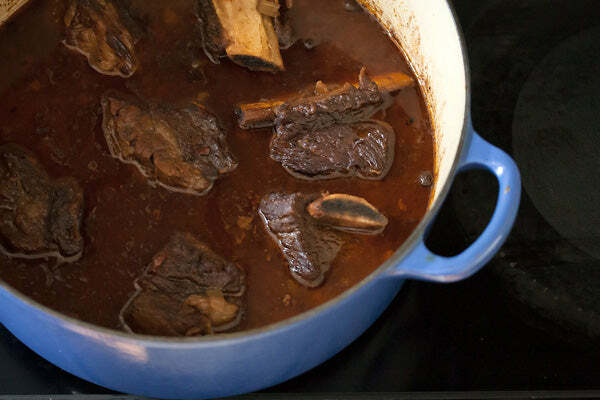 Remove the short ribs and transfer to a shallow baking dish. Cover with foil to keep warm. 7. Skim most of the fat from the sauce, then stir in the peanut butter. 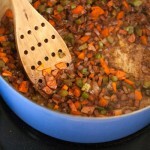 Increase heat to medium high, and simmer for 15-20 minutes or until reduced and slightly thickened. 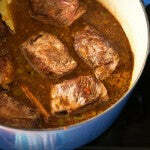 Add the short ribs to the pan and simmer for 5 minutes to warm through before serving. 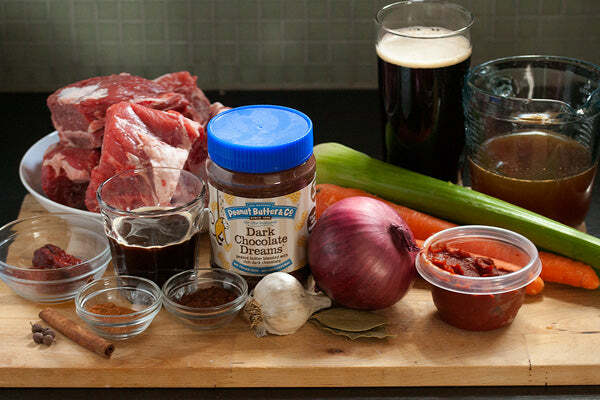 What is your favorite beefy comfort food? Leave a comment below with your answer to enter for a chance at winning a jar of of Dark Chocolate Dreams, the peanut butter used in this recipe. – The giveaway is open to USA residents only and will run until Monday, March 9nd, 2015 at 11:59 PM EST. – Winner(s) will have until 3/17/15 to claim their prize or we will choose another winner. 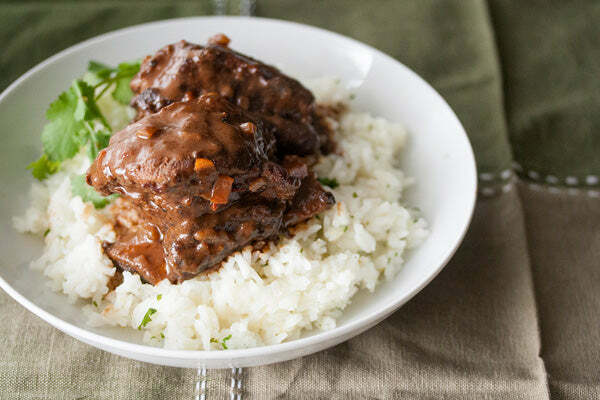 The post Braised Short Ribs with Espresso Peanut Butter Glaze appeared first on - Peanut Butter & Co. Recipe Blog.